What About the Eastern Grey Squirrel? 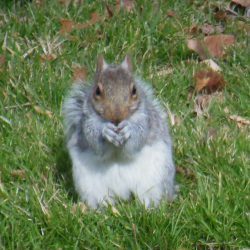 The eastern gray squirrel is getting a bad reputation as an invasive species not only in the United States, but in Canada, Ireland, Italy, and Britain. Unfortunately, their reputation is well-earned as the gray squirrel invades other areas and displaces native species such as the red squirrel. Chances are you’ve seen a gray squirrel in your backyard, cruising tree branches, sitting on the roof, or squirreling away food in a secret stash. 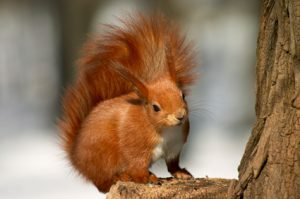 The squirrel’s coat is predominantly gray fur with a brownish tinge and a white underside. A fox squirrel has a brownish-orange belly, which is a good way to tell them apart. One of the gray squirrel’s attributes is its large bushy tail. 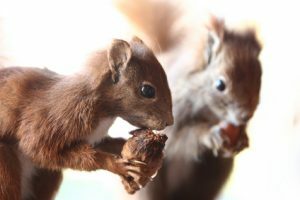 The squirrel’s body can range between 9 to 11 inches and it can weigh from 14 to 16 ounces. Also, there’s no size difference between the male and female. Gray squirrels are extremely adaptable and are always on the hunt for food. They’ll have temporary caches and permanent caches of food at all times. If you have bird feeders, that’s a handy food source. Gray squirrels also set up housekeeping in the attic to make a nest for their babies. This can cause a lot of damage. NJ pest control is at your service if you have a gray squirrel problem that needs to be taken care of. 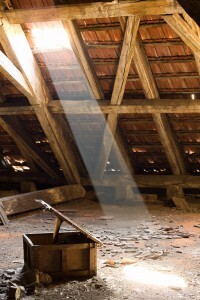 At Stern, our NJ pest control method is humane trapping. Call us today.